And Serve Perfect Brownies! Order Now! Just pay separate $7.95 fee for the BONUS Brooklyn Brownie™! Buy the Brooklyn Brownie™ Copper pan today for just $19.99 and as a special bonus, we'll double your offer and send you a 2nd Brooklyn Brownie™ Copper pan, just pay a separate $7.95 fee. 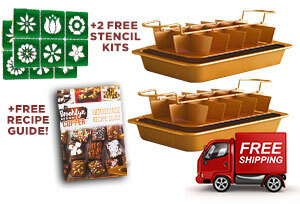 We'll also send you a BONUS Stencil Kit absolutely FREE! Your entire order will include FREE shipping! Sales tax will be applied to all orders from CA, NJ, NV and NY. A $10 shipping surcharge will be applied to all order from AK/HI. A $20 shipping surcharge will be applied to all orders from PR. ©2019 Brooklyn Brownie™ All Rights Reserved.